It is designed to be used by radiological Civil Defense personnel in determining radioactive contamination levels that may result form an enemy attack or other nuclear disaster. The really staggering thing about this meter is the range it covers: up to 500 Roentgens/hr. At that rate, your goose is cooked in a matter of minutes (first metaphorically, then literally). Stay safe and non-irradiated out there! This post is cross-posted to my more general-purpose nerdery blog, jeff.glass/blog. While I’m still exhausted from the travel and the good times, I wanted to put up a little note from this year’s Hamvention, the largest annual gathering of ham radio operators in North America. I only decided a week ago that I was going – I left Friday after work, drove 5 hours to Dayton OH (well, Xenia), and crashed at a hotel. Up bright and early, spent the day at the convention and checked out some local beer and grub in Dayton. Sunday, caught an early breakfest with some friends new and old, then got on the road back to Chicago. What a ride! Others are doing fuller summaries of the convention – SWL-ing post always does a photo wrap-up of both the indoor and outdoor experience, and the Ham Radio Workbench podcast from the event is now up. It’s wild that 15 years after I accidentally introduced the future W6KWF to ham radio we hung out together at giant swapmeet in the middle of Ohio. Totally wild. The flea market was certainly the biggest radio swapmeet I’ve ever been to – it’s probably bigger than that De Anza flea market by a good 300% – but it wasn’t all that special. I would say there was the usual assortment of used radios, test year, bits and parts, old tools… nothing super intriguing. Of course, I did get there on Saturday, so perhaps all the interesting things were just scooped on Friday. It was neat to see a lot of the vendor products in person that I’d only heard about, but since I wasn’t in the market for anything in particular, I didn’t linger too long at any of the booths. Except Elecraft – those are some very, very attractive radios. I chatted with Wayne N6KR (one of Elecraft’s founders) for about 15 minutes about the KX2 and its SDR structure, which, not to be a fanboy, was pretty exciting. In the end, I don’t know if I would go back the very next year – it was a really neat experience, and I’d go to see the people, but in this age of eBay, Amazon, and vendor websites, seeing everything in person and picking through the fleamarket feel just a little bit like a relic of the days when everything had to be done in person. A pair of QRP-Labs filters, both a low-pass and a bandpass filter for 40 meters. Sometimes, you get back from a big trip or conference or meetup thinking Boy, am I worn out, I don’t need to do any more of that thing for awhile. This time, I came how itching to get back to work, revive some projects that had been dormant for awhile, and make things. So for that, at least, Hamvention 2018 was worth it. Yesterday, I went out to the Sterling IL Hamfest. It was quite a hike from my QTH in Chicago, but it turned out to be totally worth it: I finally upgraded to an Extra class license! I’ve been casually studying for the Element 4 exam (extra class) for be past few months, with an eye toward upgrading at some point. But what really pushed me into action this weekend was a single Croatian station working the ARRL DX SSB contest, down in the part of 20m that I, as a general, wasn’t allowed to transmit on. He was at least 10-over-S9, just begging to be worked, but I couldn’t… so, a few more practice tests and a two hour drive later first thing Sunday morning, I had the Element 4 exam in hand. An hour after that, I had my Extra. There were a few more finds at the fest – the club table had a big ole junk in of parts. Mostly miscellaneous circuit breakers and switches, but way down at he bottom were seven or eight multi-turn pots for $0.75 each. What a steal! I bought as many as I could pull out of the bin. I also pulled a few NP0 caps an a bag of 12V DPDT relays. What a rush of a day it was. Looking forward to excercising my new frequency privileges this week. Hear you on the air, wherever in the band you are! About a month ago, I attended the Hamfester’s Hamfest in Peotone, IL, south of Chicago. Sponsored by the Hamfesters club out of Crestwood, IL, we had a lovely day for it, if only a little muggy. Hamfester’s had the most vibrant flea-market area of any of the fests I’ve been to so far. No lack of boat-anchor rigs to be sure, but also some newer ones for sale (an FT817, A TS450, a couple ICOM base stations). Lots of CW keys, and no lack of miscellany, but the “clear out the shack properly” contingent was definitely in full swing. They’re the ones who have new and interesting things, or spare rigs they don’t need, or tools. 50 bucks for an old tube receiver. Wonder if it works? As I’ve previously mentioned, I didn’t come home with a huge haul from this swapmeet, but I did snag an unbuilt Scout Regen receiver kit that I put together. I also got a nice 30V adjustable, 500mA regulated current-limitted power supply from Elenco, in a nice case with leads, for 15 bucks. And a dual variable-cap from The Big Pile. It was unbuilt, but the metal frontpanel already had its decals applied (or perhaps pre-printed? ), which was a nice place to start. I don’t have a great track record when it comes to applying decals and labels. The un-built Scout Regen kit, sitting atop the variable power supply I also found in Peotone. Also included: a ganged variable capacitor for future experiments. The overall build took about 2 hours. The Scout Regen Builder’s Manual from the QRPKits website is very thorough, and was easy to follow. The only issue I ran into was a missing 5pF cap for the detector section. I substituted two 10 pF NP0 caps from my stock, soldering them in series before installing them in the PCB. Additionally, after completing the first part of the detector section (basically, everything installed but the coil and the power switch) the current drain had jumped to 20 mA. After finishing the build, the current dropped back to under 10 mA. How odd. The completed Regen receiver kit. Listening with this kit is a lot of fun. Regen control is smooth, but very narrow; I may replace the regeneration control knob with a larger one. There’s all kinds of interesting things in the span of the receiver. Shortwave stations, the 80m and 40m hand bands, I found a couple different “WLO” beacons… really nifty. It’ll be nice to put on in the background while working on future projects. Hear you on the Air! This past Sunday morning, bright and early, I made my way out to my second Chicagoland hamfest, the Six Meter Club of Chicago‘s annual hamfest in Wheaton, IL. 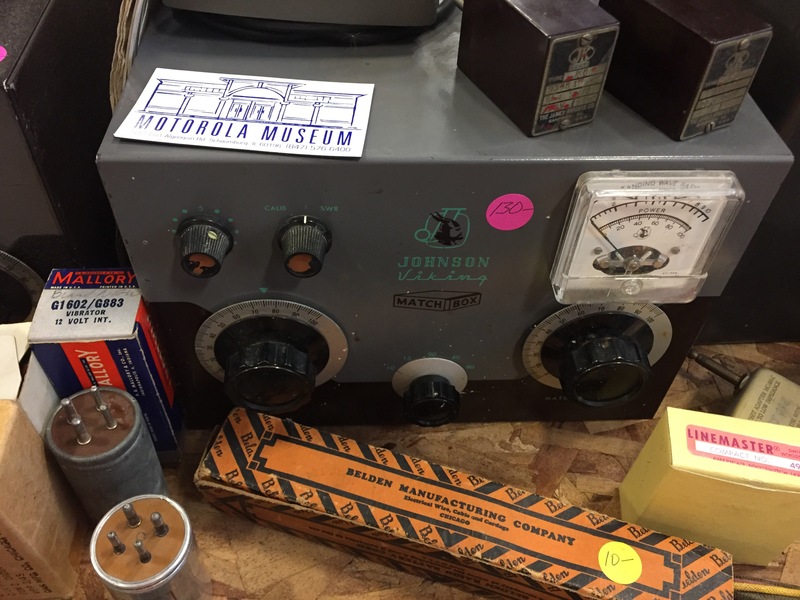 It was quite different in feel and size to the De Kalb Hamfest I attended a couple months ago – not better or worse necessarily, but definitely different. Where the De Kalb hamfest was spread out over several long winding paths and four or five buildings, all of the tailgaters in Wheaton were compacted in one central parking lot, which was already filled and thrumming when I arrived at 8:02. With the thermometer and humidity spiking by 9am, it was nothing like the foggy March morning of the last Hamfest. Even the morse keys need shade on a hot day. In terms of sellers, I would say the Wheaton hamfest had perhaps a third as many actual vendors (including The RF Adapter Guy and all his wears and a few others) but three times as many tailgaters. Many tube radios to be found in the parking lot, same a last time, and maybe five or six folks with a healthy collection of CB gear and some antique television sets. If you need tubes, there are three or for folks who would love to unload theirs. I picked up a few little things early in the day – some more trimmer capacitors, a couple used hand mics and panel-mount connectors for the same, but nothing was really catching my eye. There were more parts-dealers at Wheaton then out in De Kalb, but no one really had anything special that caught my eye. I did find a couple twins to the air-variable capacitor that I picked up, with and without casings, but no split-stator types, which is what I’m hunting for now. Not many enclosures or antenna parts either. A very similar variable capacitor to the model I picked up in March; I think this was the same gentlemen who was selling them in De Kalb as well. Then, once there were no items left that anyone wanted to bid on, the gentleman in charge announced, “Everything left is $5. Grab what you want, and get your $5 to Rudy.” Rudy did well for himself at this point, and maybe half of the items vanished. Once the dust had settled, the gentleman in change once again proclaimed, “Alright, now everything left is a dollar!” Well, for just a dollar…. and once that was concluded, anything left on the ground was set loose for free! All in all, I snagged an MFJ-207, a big analog multimeter, an antique transistor radio, and a hustler resonator for under $20. Not too shabby! I must remember to stick around for Auctions in the future. After that, a quick trip to Fry’s and Menards capped my morning, and I was home by 2pm. Another great, friendly, fruitful hamfest. An MFJ 207 Antenna Analyzer. The big score of the day! I’d be eyeing an identical unit in the parking lot marked at $70, but to score this one, working, for $15 at the auction really made my day. All it needed was a new battery. A Micronta Analog Multimeter. With settings for AC and DC voltage and current measurement, as well as resistance, it’s a neat unit with a six-inch analog meter movement. It’s in pretty good shape, but I’m sure it’ll need new batteries. An Arvin 9562 Transistor Radio: Apparently made in the late 50’s, it’s got an attractive wood case and a big ole internal six inch speaker. I was planning on gutting it and using the case, but it turns out the thing actually works – it turned on while I was carrying it in from the car and scared the bejeazus out of me. A Hustler 40m Resonator: I took a flyer on this, since it was free. It’s designed to go on a mobile vehicle mast and turn it into a 40m antenna that’s only 6′ long. We’ll see what it gets gutted and turned into. Two baggies of Trimmer Caps of a couple different sets of values. A Small Metal Box – can never have two many enclosures! A two-pack of NTE110 germanium diodes (from Fry’s electronics, on my way back home). Another swell time hanging out with hams. And with ARRL Field Day coming up this weekend, I’m sure I’ll have more ham stories to tell. In the two days I’ve had it, I’ve already put the antenna analyzer to good use out by the lake, but that’s a story for another post. I’ve been trying to think how long its been since I’ve been to a ham radio swapmeet. Certainly the last one I visited was the Electronics Flea Market at De Anza College with W6KWF sometime during my college days. So it’s been a good long while, and it seemed time to rectify that. And thus, I’m just back from the DeKalb Hamfest. First some details, and then I’ll get to today’s haul. A bit of a long post today, but there’s much to tell. 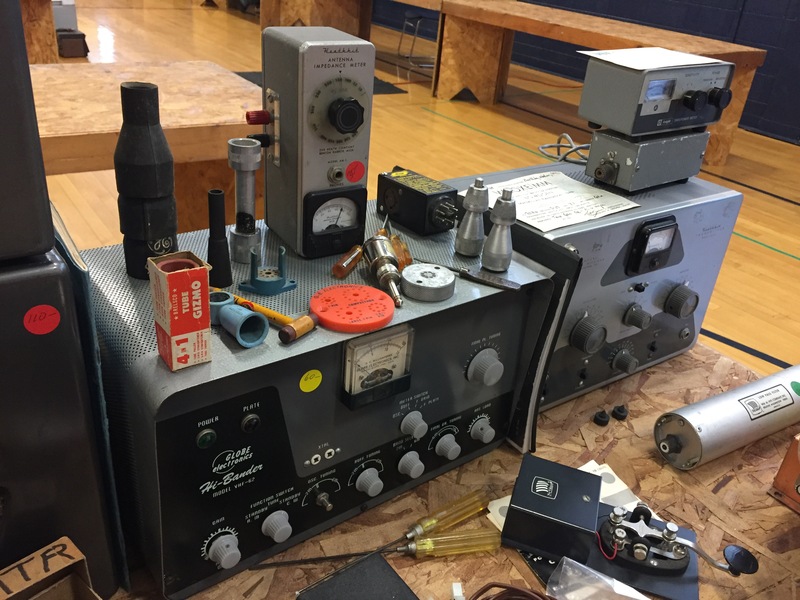 A brief overview – the DeKalb Hamfest is hosted by the KARC – the Kishwaukee Amateur Radio Club – and overseen by Bob W9ICU. It’s hosted at the Sandwich County Fairgrounds in Illinois around this time (early May) each year. $8 for admission, and easy parking. It wasn’t a huge event – maybe 10 or 12 indoor vendors and perhaps three times that many tailgate-ers. The indoor vendors, while they had lots of nice products, didn’t particularly entice me, as I think you could find just as good value on, say, banana-jack-to-BNC tails or audio connectors anywhere online. There was one vendor with a huge spread of every RF adapter and then some, as well as individual toroids for sale, including some big 100- and 240- size ones in unusual mixes. I’ll look for them at future fests. RF adapters and connectors for miles. The tailgate-ers were more my speed, though none of the big-ticket items were really what I was looking for (or in my price range) Several old Heathkit receivers and transceivers for sale ($200-$600), lots of microphones, mobile units, CB radios. A few newer items, but mostly old tube equipment. At least four tables had the same Heathkit GD-1B Grid Dip Meter, which I found curious. Lots of vibroplex keys marked over $100. But lots of treasures too. Maybe only three or four tables with proper parts bins, but I spent a good couple hours pouring through these to find some treasures. Most table owners were happy to make small talk and chat about their projects and where their goodies came from. I had a really laugh chatting with some of the nice folks running the tables, while piling up the day’s haul. A pack of five unlabeled compression trimmer capacitors. These turned out to have a range of about 2-25pf. A bag of ~10 small toggle switches with assorted mounting hardware. These range from SPDT to DP4T. A large bag of ~20 rotary pots of assorted values, with a few rotary switches thrown in for luck. A large air-spaced variable capacitor – unlabeled, turned out to be about 28-152pF. More on this below. A nicely boxed step-attenuator with 50-ohm input/output impedance. I’d been thinking about building one of these, but running across one of them at the fest (for only $3) was a dream! It has a maximum of 59 dB of attenuation in steps of 20, 20, 10, 6, and 3 dB, as well as a variable attenuator (“3 dB?”) for fine tuning. It has Walter Schwartz’ name on the bottom, who was the nice gentleman who sold it to me. A very cool older ham. A mysterious silver box… more on this below as well. A bag of twenty 47pF NP0 capacitors. For future oscillators. A couple bags of trimmer pots. One bag had five 500 Ohm trimmers, the other turned out to have a mix of 1K and 1M trimmers. I have these in mind as balance pots for diode mixers, but we’ll see where they end up. A couple vacuum-molded packs of trimmer capacitors, 10-. These actually came from the Fry’s Electronics in Downer’s Grove – I couldn’t resist a visit on my way back to Chicago. And I got to help a dad pick out resistors for his ten-year old’s first electronic’s project. Neat! All of the above for less than $20 total. Hamfest, for the win. Since I didn’t have either a multimeter or an LCR meter with me, I had to make my best guess as to the voltage rating and capacitance of this unit. When I got it home, it turned out to have a capacitance that varies from about 28pF fully open to 152pF fully closed, with stops at either end. The plate spacing (measured with a caliper) is about 0.060 inches, which means it should start to arc-over at around 2400-2600V. I have a specific project in mind for this guy: building a small transmitting loop antenna. A range of ~28-150pF should be enough to tune a 10′ circumference loop for the 20m, 17m, 15m, and 12m bands, as well as the 10m and 30m bands with a little fudging (this according to the 66 Pacific Loop Antenna Calculator). With some added capacitance in series or parallel and it could possibly be pushed to 10m, 40m, or 80m bands with reduced efficiency. The air-variable capacitor is key here, since it seems the voltages in a loop antenna can peak over a Kilovolt with just 10-20W of output power! In any case, more thoughts on that antenna as it comes together, but for now I’m drawing ideas from AA5TB, Nonstop Systems, KR1ST, W8JI, and VK3YE’s various projects. In any case, one of the nice things about this particular air-variable is the reduction drive on it. You can see the worm-gear and larger reduction gear in the picture above – it takes 46 full revolutions of the small stud to shift the capacitor full fully open to fully closed. With a difference of 122pF between the two extremes of the capacitor, that’s an average of 2.7pF per revolution. Even using the bamboo-stick tuning method used by KR1ST (to avoid detuning the antenna by getting close to it), if I can manage rotational accuracy to about 10 degrees of the tuning stud, that’s a resolution of .07pF. Not bad! One of the things I was on the hunt for this morning was a metal chasis or two to mount projects in. As nice as the Virgin Receiver turned out, I was hoping to find something a little more robust for future projects – maybe some old CD-drive casing or a gutted something or other. There wasn’t a whole lot of that sort of thing around, even in the big-piles-O’-parts, but then this silver beauty caught my eye. Judged by the two parts labelled “10.7 MCycle Interstage”, I feel pretty confident that this was indeed a receiver of some kind. More than half of the tube-sockets are empty, so I don’t think it’s worth trying to figure out what they were and bringing this thing back to life. But check out the nifty components! Up front is a 4.5:1 vernier reduction drive, controlling a two-section air-variable capcitor for some kind of tuning. There’s a 30pF NP0 trimmer cap and a coil mounted directly to the air-variable, which is interesting. There’s a couple of 500K log-scale pots, a bunch of high-voltage capacitors, some old carbon-composition resistors, miniature RF chokes… this thing is going to be a great source of parts, as well as a keen chassis for a future project. Perhaps a regenerative receiver? I could see leaving that classy vernier drive capacitor in place as is and working around it…. hmmm…. Hear you on the air, and see you at the fest!